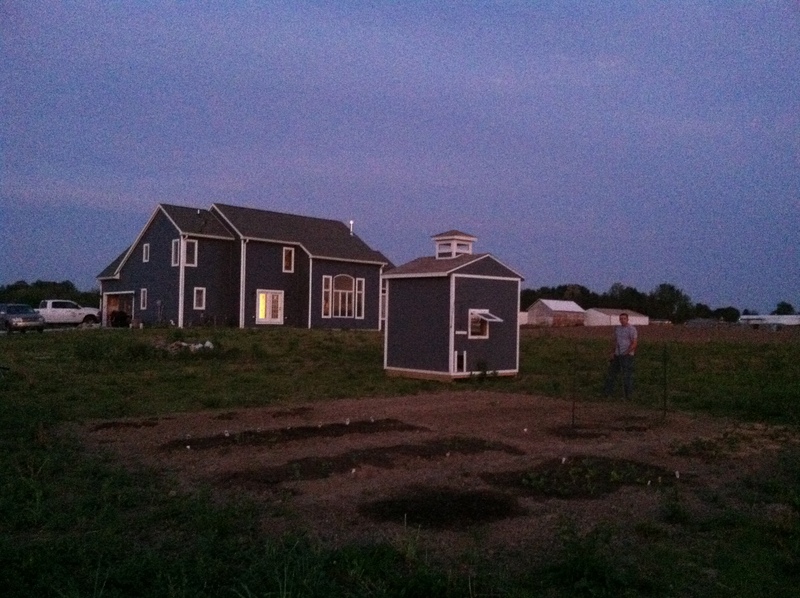 Go Garden: Getting Started | Bloom. We talked money, health, and reducing your impact on the earth and, if I did my job right, you are convinced. If not, read the money one again. This works really well because it’s just about time to get plans going for this summer’s garden and to get seeds started. I like to start my seeds inside because it means I will have vegetables earlier and take full advantage of Indiana’s growing season. Getting seeds started last spring. Before you get seeds planted, it’s important to know your area’s last frost date. The USDA’s website has a great tool for finding your last frost date. 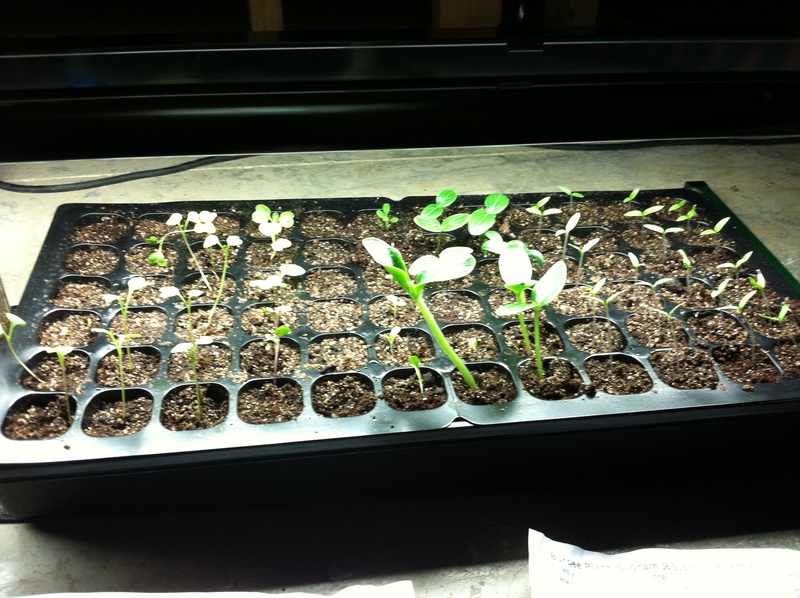 Most seeds are ready to transplant into the ground after about six weeks. So, I will be starting seeds indoors within the next few weeks and will be posting about the whole process. If you want to get growing and follow along with me, here are a few things you should do before we get “dirt”-y! First year veteran caveat: Start small. Reasons? Too much too soon can be overwhelming. There’s weeding, pest control, watering, etc. needed for every plant. Not to mention, it can also mean you are swimming in produce before you know it and your good food could go to waste. 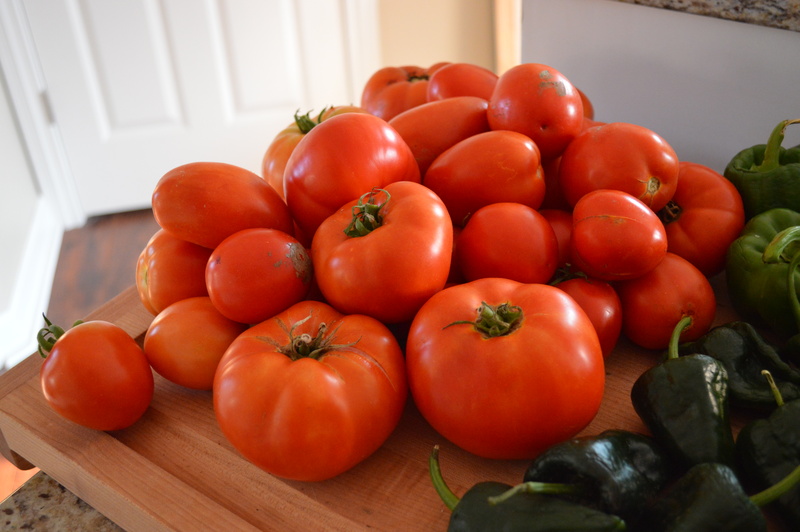 Note: A solution to too many garden veggies? After annoying your friends and family members to “Pleeeeease take some zucchini” and/or ding dong ditching your neighbors leaving behind baskets full of cucumbers (Hmm… just me?? ), take them to your local food pantry. We have a church down the street that serves our community and they love to have fresh veggies because they are not seen often. Another thing to keep in mind, and it should be common sense but, only plant things you want eat. Even though Butternut Squash is becoming super trendy, but it will never grace my garden. (Okay, never say “never…”) But, for now… I just can’t. The texture. Bleh. Our plants grow in the ground, but you could use containers on your deck or create raised beds. Whatever works with your situation, be it a yard or just a balcony. Our garden in late May 2013. Seeds had recently been transplanted into the ground. Our garden faces west in order to receive plenty of sun. Surprisingly, plants don’t need too much space. – At least six hours of sunlight a day. But, if you don’t have full sun in your yard don’t feel like a garden is a lost cause. Plants like leafy greens do great with shade. – Water… Unless you really want to work on your biceps and walk back and forth with a full watering can, make sure your hose can reach the garden beds. You can thank me later for that one. There are great seed starting kits that can be found at any home improvement or garden store. These kits make it super easy. There are directions right on the kits. Some even have “greenhouse” covers to help keep heat in, replicating the warmer, summer temperatures. Seed packets can also be found at home and garden stores. I even saw them at the grocery store today. Last year all our seeds were packaged by Burpee. I enjoyed them and they worked out great. Burpee is an excellent brand and you will be able to find their products easily. We will be growing many different Burpee seeds this spring. However, there are lots of other seed companies out there. Adam and I are planning to try a couple different companies, such as Gurney’s. Their seeds come through the mail. Many of the seed companies out there also have Certified Organic seeds, if that’s something you are interested in. Also, Adam and I use Grow Lamps to provide artificial light and heat to plants in the beginning. I have a friend who puts her starter kits right by a window that gets a lot of light throughout the day. Her plants do great. It’s up to you and how much you want to invest. You can find Grow Lights in many different sizes and levels of quality so their prices can range from $50-$500. 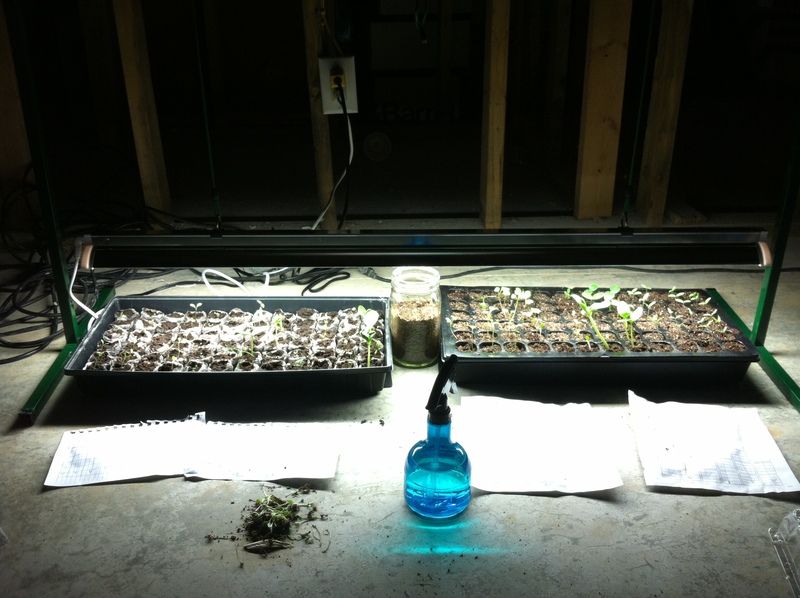 Our Grow Lamp, starter kits and spray bottle in 2013. Label sheets are on the floor in front of the kits. Labels and a marker: I made ours last year with toothpicks and label stickers so that they looked like little flags. Spray bottle: These are super cheap and you can find them anywhere. Make sure they didn’t hold any cleaning chemicals before you use them to water your plants. Alright snow… get out of here. 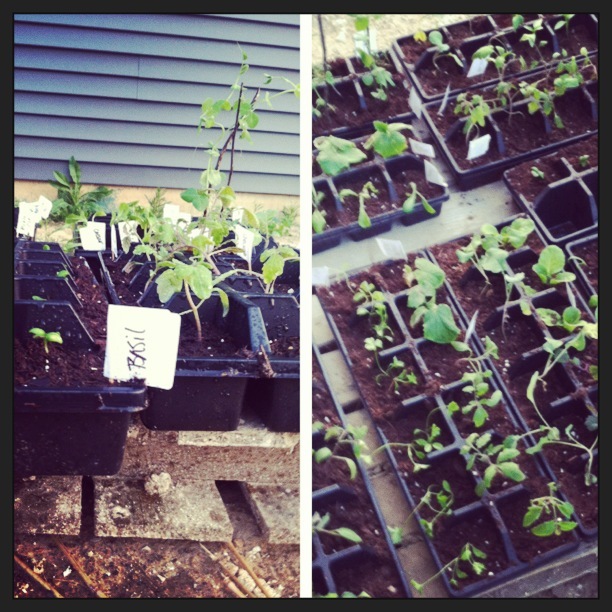 We have garden’s to plant!